Your health. Your vitality. Our mission. We Can’t Stop Juicing Celery! We’ve been getting a lot of questions about celery juice lately. How much celery should I juice? When should I drink it? Is it better to blend it or drink it straight? It seems like, overnight, celery juice became unexpectedly popular. We’re totally on-board, but also a little surprised. Celery isn’t some exotic superfood—it’s celery! Why is everyone suddenly so interested in this veggie-herb? Celery is naturally rich in antioxidants, fiber, and certain important vitamins and minerals (including crucial electrolytes like potassium and sodium). Celery juices aids in treating such respiratory ailments as asthma and bronchitis. In studies, its active constituent coumarin reduced blood pressure by up to 14% in patients with hypertension! Additionally, celery contains the phyt onutrient phthalides, which has been shown in studies to also effectively reduce high blood pressure. Celery is known to stimulate the beneficial production of stomach acid, which means it’s great for digestion. Plus, there’s a chemical in celery that helps to protect the lining of the GI tract, making it ideal for reducing intestinal inflammation. Celery is also effective in helping to prevent colon and stomach cancers. Celery can help balance blood sugar, calm the central nervous system, and help soothe inflammatory skin conditions. The mineral salts in the celery juice give extra support to other heavy metal detox foods by helping to flush metals out of the liver. Looking for an affordable way to start juicing celery daily? We are so excited to be offering the brand new Shine Cold-Pressed Juicer from Tribest. It’s the perfect machine for daily, light juicing—like making 16 oz. of celery juice in the morning. And, it’s the most affordable, high quality juicer on the market! Check it out below! And use coupon code “TURNIPTHESAVINGS” for 5% off. Use Code: “TURNIPTHESAVINGS” at checkout. Previous Previous post: Meet Charlie — The Sprout Dog! 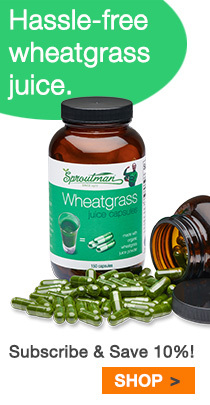 If you're looking for organic sprouting seeds, books to enhance your health, super convenient wheatgrass juice capsules, a new sprouter, juicer, blender, dehydrator, or something more, our wellness store at Sproutman.com is the right place for you to be. Have a look! We're here to help.